STINAPA Bonaire is working together with the Dutch Caribbean Nature Alliance, Holland and the other Dutch islands to put an end to the slaughter of sharks in the Dutch Caribbean. With funding from the National Postcode Lotterij, STINAPA will work with local communities, fishermen and scientists to create support for shark conservation, ban commercial and targeted fishing of sharks, and establish a shark and ray sanctuary. Sharks are apex predators and are important to our oceans because they keep ecosystems in balance and keep fish healthy by feeding on the weak, old, and sick fish. Because sharks and rays have been overfished worldwide, many species are now threatened with extinction. We must act quickly to protect these important ocean predators. STINAPA’s first year of the Save Our Shark program (August 2015 – July 2016) is focused on reaching local communities through education and outreach. STINAPA launched the Save Our Sharks campaign in August 2015 with a Shark Week that involved educational programs with youth groups and at resorts, the showing of the shark conservation movie, ‘Shark Water’, and two festivals involving games and contests for children. During this first year STINAPA has been and will continue to educate local people through school visits, adult educational programs, newsletters and local festivals to promote awareness of how important sharks are to the oceans and the peril sharks face. The second year of the program (August 2016 – July 2017) will focus on forging ties with local fishermen. Soon after the project began in the summer of 2015, Bonaire became part of the Yarari Marine Mammal and Shark Sanctuary. All sharks and rays in Bonaire’s waters are now protected. No fisherman or foreign fishing fleet can target sharks in our Economic Exclusive Zone, which is great news for sharks and rays, but local fishermen have many questions about how to deal with the new protection status of these fish. For these reasons, it is essential for STINAPA Bonaire to become partners with the local fishermen and aid them in whatever way necessary with these new laws. Fishermen exchanges will be organized where our fishermen will be given the chance to learn from visiting fishermen and researchers how important sharks and rays are to our waters and how to release sharks when hooked. New fishing gear will be encouraged and available including circle hooks and shark dehookers. Visiting fishermen will also offer training sessions on how to catch, tag and release sharks and rays. If our fishermen choose to become involved in a Dutch Caribbean wide tag and release monitoring program, they will be able to earn alternative income while protecting sharks and adding to the scientific knowledge of sharks in our near-shore waters. Since sharks are difficult animals to learn about, this tagging program will provide us with information about shark species, numbers and migratory patterns, which will help us to understand and protect these important animals. The third year of the program (August 2017 – July 2018) is geared towards doing research on sharks and rays in Bonaire’s nearshore waters. STINAPA will be working together with IMARES to learn about the sharks found in our waters by using sBRUV (stereo Baited Remote Underwater Video) equipment and establishing a shark and ray sighting network. Data (videos) of sharks and rays will be collected in different locations at different times to find out which species of sharks frequent our waters and give us an idea of numbers of sharks as well. 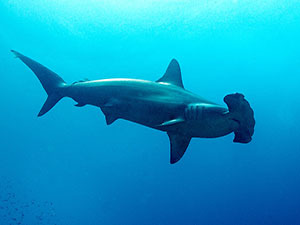 STINAPA will also encourage fishermen and SCUBA divers to send shark and ray sighting information to STINAPA. We are already busy collecting sighting information and are planning a Dutch Caribbean wide sighting network. Sighting data will also be used to learn about the species of sharks and rays that frequent our waters and possible migratory patterns. By the end of the Save Our Sharks program, Bonaire and the rest of the Dutch Caribbean will have a public that is aware of the importance and protection of sharks, fishermen will understand the new legislation and will be on-board with shark and ray conservation, and we will have a much better understanding of the species of sharks and rays found in the waters of the Dutch Caribbean.